After a disappointing 5th-placed finish in last year's Women's County Championship, Sussex are looking to put a better spin on the new season, with the signing of Aussie off-spinner Erin Osborne; and the return of England leftie Holly Colvin. Osborne, who will be with the county for the first half of the season, before joining up with Australia's Women's Ashes party, has over 100 international wickets; and played in both of Australia's recent ODI and T20 World Cup wins. 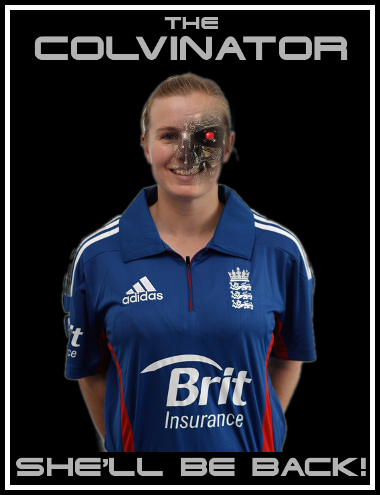 Colvin, with 174 international wickets to her name, is already a legend; and holds one record - youngest England international - which now we are into a new professional era, will probably never be broken. Holly took a break from cricket last year, though she played a couple of charity matches; but now she's back, and England fans (and no doubt the selectors too) will be watching carefully! Will she play for her country again? She has modestly told friends that she doesn't know; but she's a competitor, who wants to perform at the very highest level, so as the Americans say... you do the math!! With Sarah Taylor in imperious form with the bat on England's recent tour of New Zealand, Sussex will be feeling optimistic about the new season; but Taylor will need to play responsibly if Sussex are to challenge Kent for what could be the last ever Women's County Championship title. It's great to have Holly back with Sussex! Fantastic player.